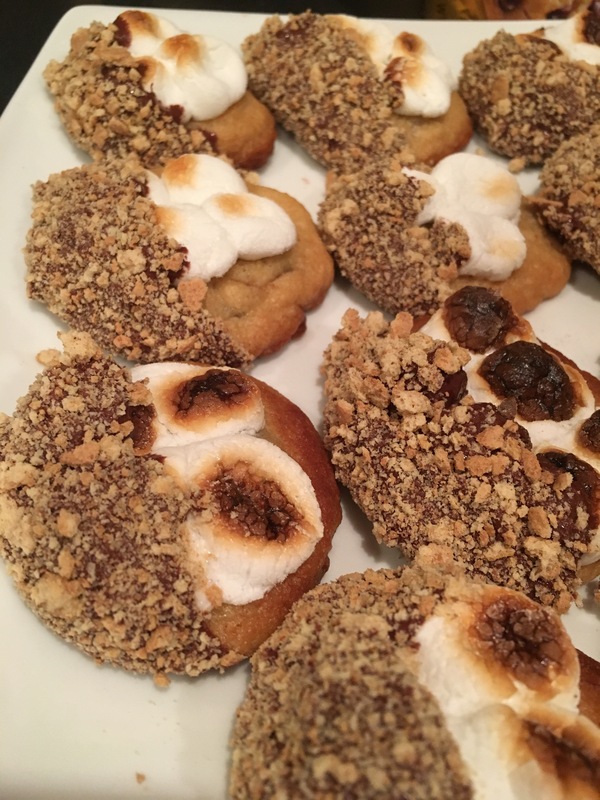 S’mores Cookies – Eat, Drink, and Go! Ok, I know I don’t usually blog about desserts/baked goods, but this treat was blogworthy for sure. 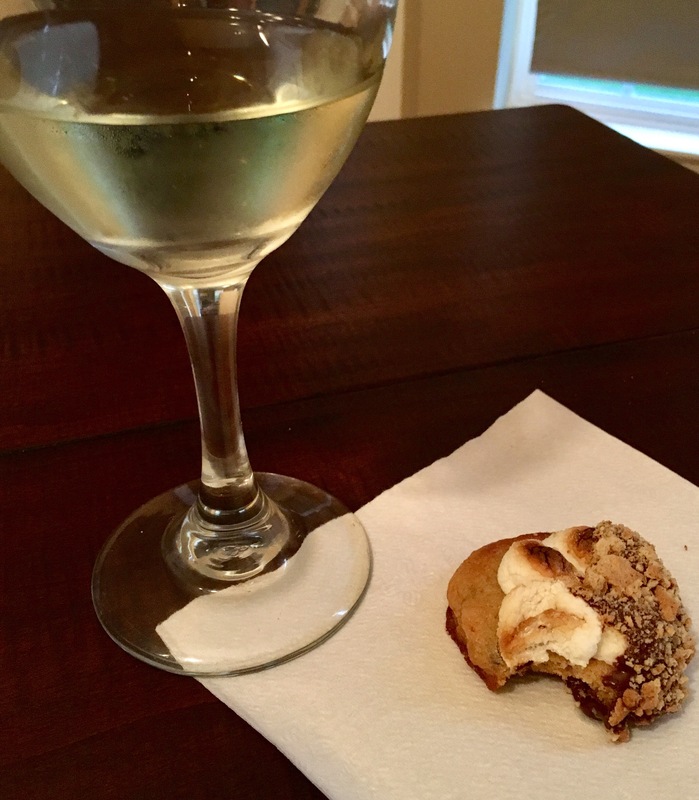 My sister and I both saw the same thing or Facebook recently showing these cookies, and we already had plans to get together over Memorial Day Weekend. And the kids saw it too. It’s fun to be like, “oh the kids will LOVE this” to absolve yourself of any glutinous guilt. So this was going to happen. 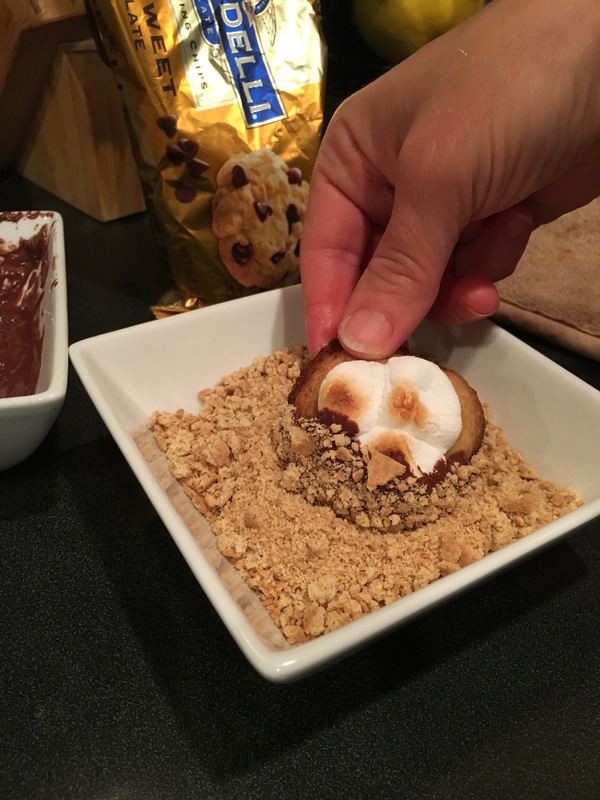 Chocolate chip cookies s’more-i-fied. Start with freshly baked chocolate chip cookies. 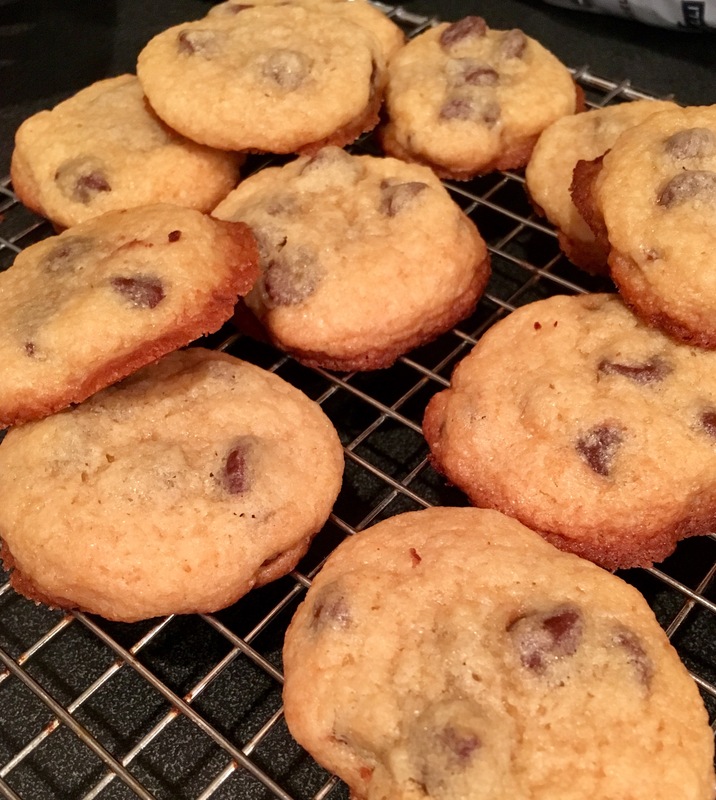 I have a great recipe for chocolate chip cookies handed down from my mom, for another time. We shortcutted here and just used a nice Betty Crocker chocolate chip cookie mix for ours this time. 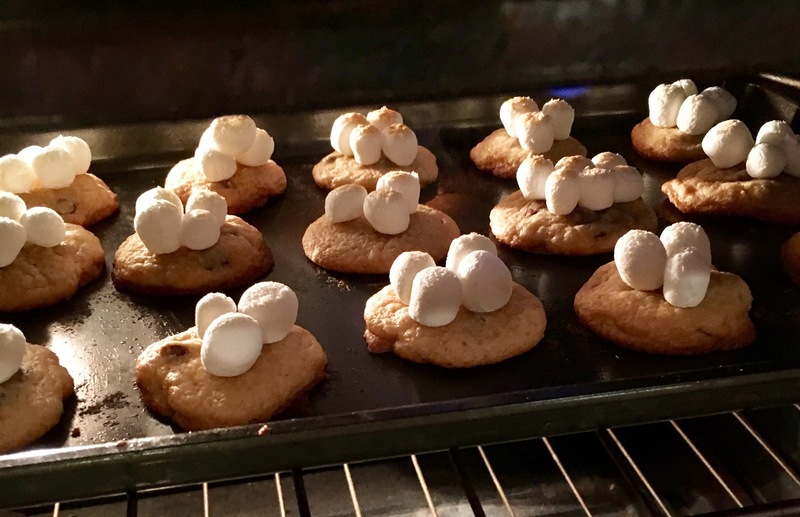 Then, place a few mini-marshmellows on top of each. 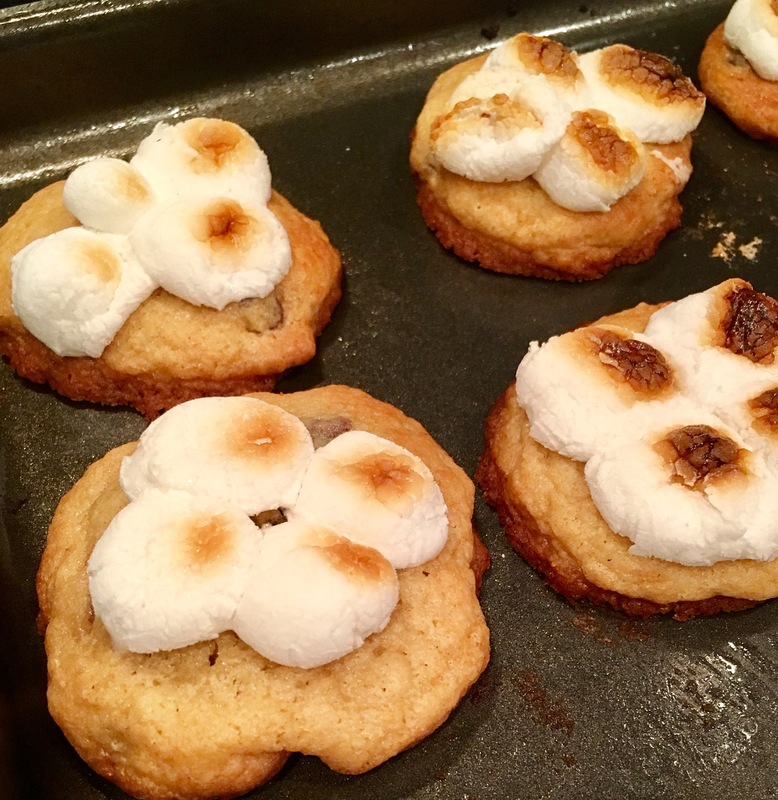 The Facebook post must have been using giant cookies because there were many mini marshmallows on them, so ours are the mini version. 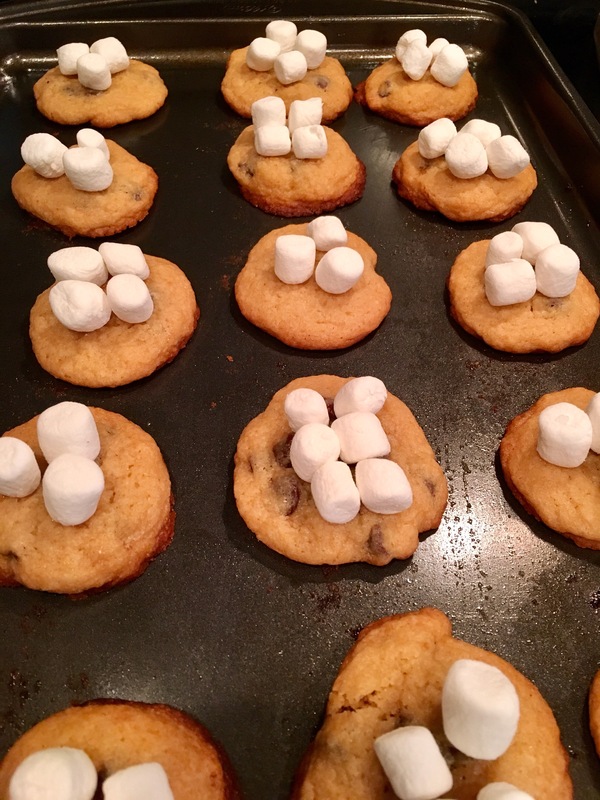 We made the cookies small so we could eat more of them! About 3-6 minis on each is good. Turn the oven onto broil so you just get the marshmallows browned. We were thinking a culinary torch would be good here for the perfect toasting, but I have no idea where mine is these days. Can’t recall the last time I made creme brûlée and that’s all ever used it for. 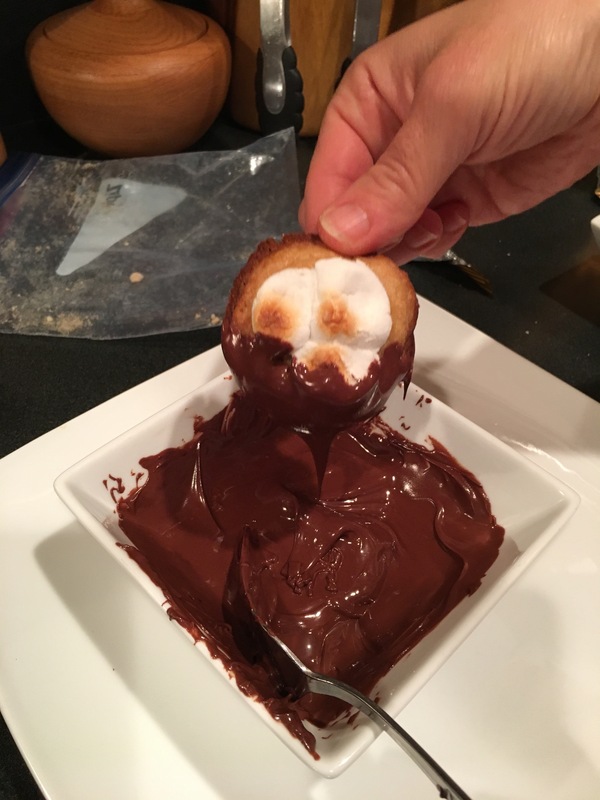 Anyways, the broiler worked fine, just keep a close eye – like you would on the marshmellows over the campfire! They can go from brown to black very fast. Once toasted, let the mellows mellow, we pushed them down just a little bit while they were still hot. We melted some semi-sweet Ghirardelli chocolate chips for the first dipping. Dip about half the cookie in the chocolate. Oooooo!! That’s the sound you have to make when you see chocolate dropping off of anything, right? The second dipping is into crushed graham crackers. I think they make them already crushed, but it was super easy to place four crackers in a ziplock bag and crush them with a mallet to crumbs, plus that was more fun. The crumbs instantly adhere to the warm melty chocolate. Ahhh. And that’s it!! We could not resist the temptation to have seconds. Ok, thirds if I’m being honest. 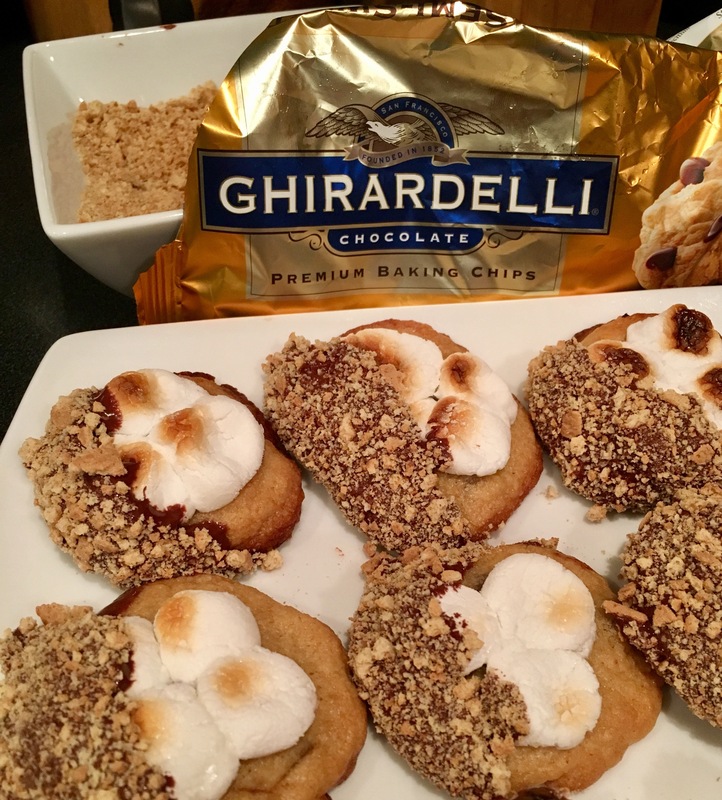 They were delicious – the perfect love child of a cookie and a s’more! The kids love them too, of course!! 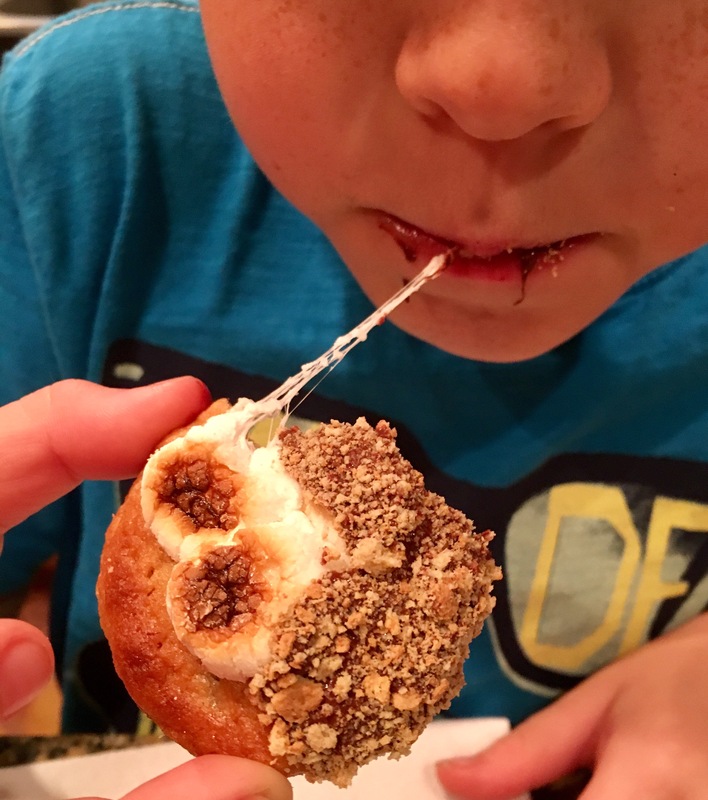 Gotta get that shot of a string of melted marshmallow from the cookie to those cute little kid lips!! Take two! But the grown ups paired them with wine!! Wow! Perfect end to a Memorial Day BBQ! 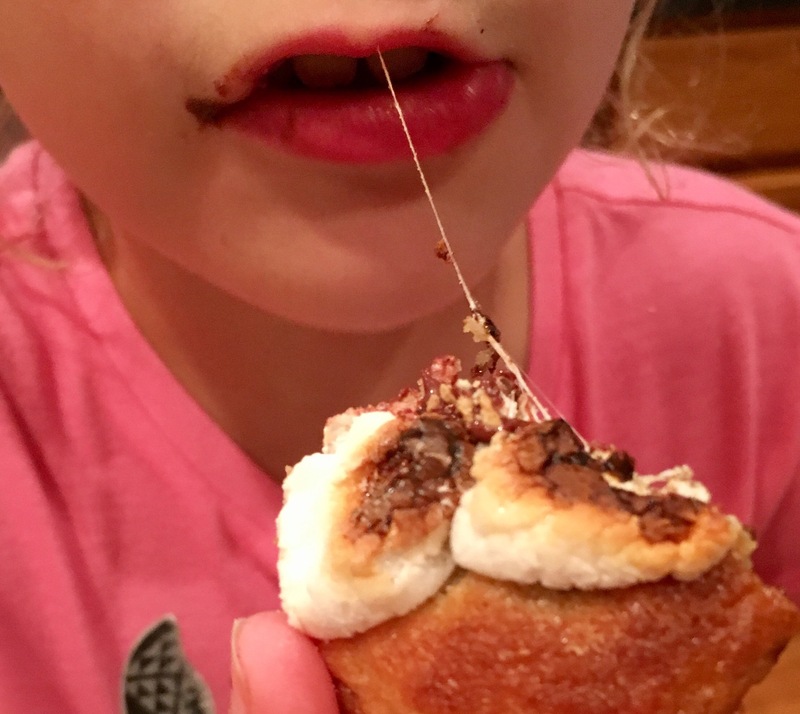 Love the pics of the melty yumminess being enjoyed that still provided the little ones with their privacy. Well done.